1 of 7 Heat oven to 350 degrees . Line an 8 x 8-inch pan with aluminum foil; coat with nonstick cooking spray. 2 of 7 In a large bowl, whisk flour, cocoa powder, baking powder and salt. In another large bowl, beat butter and sugar with a hand mixer until fluffy, about 2 minutes. Beat in eggs one at a time until well combined, then beat in vanilla. 3 of 7 Mix dry ingredients into wet ingredients on low speed until just combined. 4 of 7 To make cheesecake batter, beat softened cream cheese, 1/2 cup canned pumpkin puree, sugar, egg, 1/4 tsp pumpkin pie spice and salt until smooth. 5 of 7 In a separate bowl, add 1/2 cup canned pumpkin puree, milk and 1/2 tsp pumpkin pie spice to wet brownie ingredients. 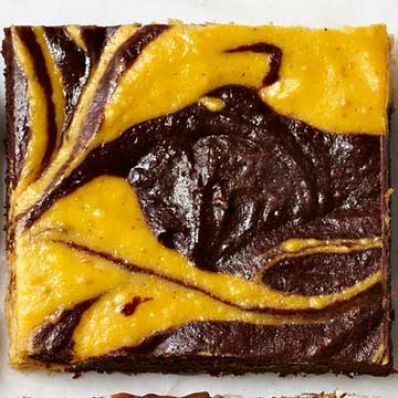 6 of 7 Alternate dollops of brownie and cheesecake batter in pan, then use a knife to make swirls. 7 of 7 Bake at 350 degrees for 35 to 40 minutes, until a toothpick inserted in center comes out clean. Cool 10 minutes, then lift out brownie in foil, place on a wire rack and cool completely. Per Serving: 130 mg sodium, 4 g pro., 2 g fiber, 19 g carb., 7 g sat. fat, 65 mg chol., 13 g Fat, total, 200 kcal cal.